Ok - so I'm not entirely sure what drew me to this recipe because honestly in the things I like/don't like but will eat category this recipe has a lot working against it. I am not a fan of cucumber (unless it is in greek salad), I am typically not a fan of radishes. However, for some reason I decided to give this one a try. Now I had no idea what Chaat was, and when the recipe called for Chaat Masala I could not find it on any of my culinary adventure tours with the husband (totally something that I should do again this weekend) but I figured I could make things work. I have to say the salad was AMAZING! 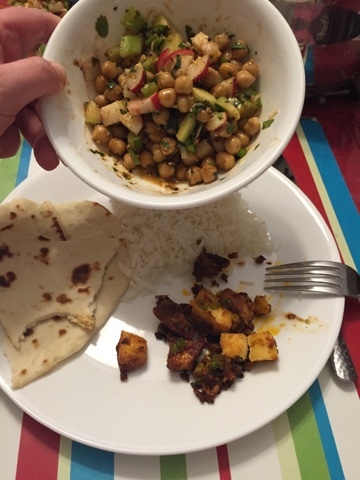 I made this one night after kidnapping by best friend Serina from work and "made' her help me clean out my fridge and then forced her to eat my home cooked Indian food (yes I'm a terrible captor in that way.) Serina is also not a fan of most things in this recipe and down right HATES cilantro (more than spiders I would say) ... anyways she also really liked the salad (she did pick out some of the larger pieces of cilantro and if you are like her and don't like cilantro I wouldn't skip it - I would cut back on the amount and make sure the leaves are very finely minced to almost a paste). I don't know how to describe what the salad tastes like other than it was amazing - full of interesting textures, full of warmth and flavour while not being overwhelming. I will say I normally love salad in the summer on really hot days - but this salad (despite being a dish served cold) still had that soul warming quality I would look for in the cold winters here. The big problem I did run into was pomegranates as they were not in season. Serina didn't miss them from the dish, but I think we both agreed that it would have been a good addition to the salad. I did substitute in mine some pomegranate molasses which added that flavour but obviously not the pop in the mouth that would come from the seeds. So because I could not find Chaat Masala I made my own. Turns out that masala means spice mixture from the Hindi word for spices (honestly yes it did take me a little while to figure that out...) Serina came to rescue and found a Chaat Masala mix recipe, which we used with some..improvising on some ingredients. First - asafoetida (still have to find some) - but on some reading it has a strong garlic-onion flavour so I substituted onion and garlic powder. I didn't have Amchoor (still have to find some) so I used pomegranate powder instead it seemed to work but I can't wait to try this again with the proper spice mix - just know it's ok to find things close or similar and try them out. Dry roast the cumin and fennel seeds in a small pan over low heat for about 5 minutes or until the cumin seeds darken a few shades. Add in the asafoetida(or garlic/onion powder) and stir in to mix well. Take off of the heat and use a spice grinder (aka repurposed coffee grinder) and grind until powdered. Add the remaining ingredients and pulse to mix. Chaat Salad in the bowl. Take your sharpest knife and chop the cucumber into small cubes (each one should be about the size of a chickpea). Chop up the radishes the same way. Slice the scallions into thin rings and put everything into a salad bowl, along with the pomegranate seeds. Finely chop the cilantro - leaves and stems - and add it to the bowl. Next, put the oil into a small frying pan on a medium heat. When it's hot, add the mustard seeds, leave them to pop, then add chickpeas. Fry the chickpeas for 3 to 5 minutes, until they start to crisp up nicely in the pan, then add the child powder, salt, sugar, and lemon juice. Turn the head down to low and add the coconut, then stir a couple of times and take off the heat. Add the spiced chickpeas to the salad bowl and sprinkle over the chaat masala.